For most of us, the weather is, on a day to day basis, not much of a concern. We just have to switch on the television set, the radio or go on the ætherweb to check the weatherforecast for the next few days. Unless a storm, heavy rain, or, like this year, massive amounts of snow are coming, the weather is not much of a bother. It was not always like this. Until relatively recently, forecasts of more than three days were guesswork, before that, you could hardly tell more than half a day. Maybe less, depending on the conditions. Think about it, without meteorology, transoceanic flight would be far more hazardous, maybe impossible at times. Well, OK, maybe not any more, but plains could not always climb that high. The reason why I tell you this? Well, in 1855, on February 19th a big step in the field of meteorology was taken. 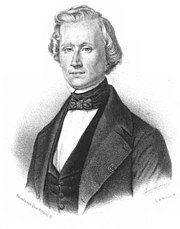 The French astronomer and mathematician Urbain Le Verrier presented the first ever weather map. This may well seem a trivial achievement to most, but it was one big step in the field of modern meteorology. To us, it is maybe a simple idea but even simple ideas are something someone has to think of first.